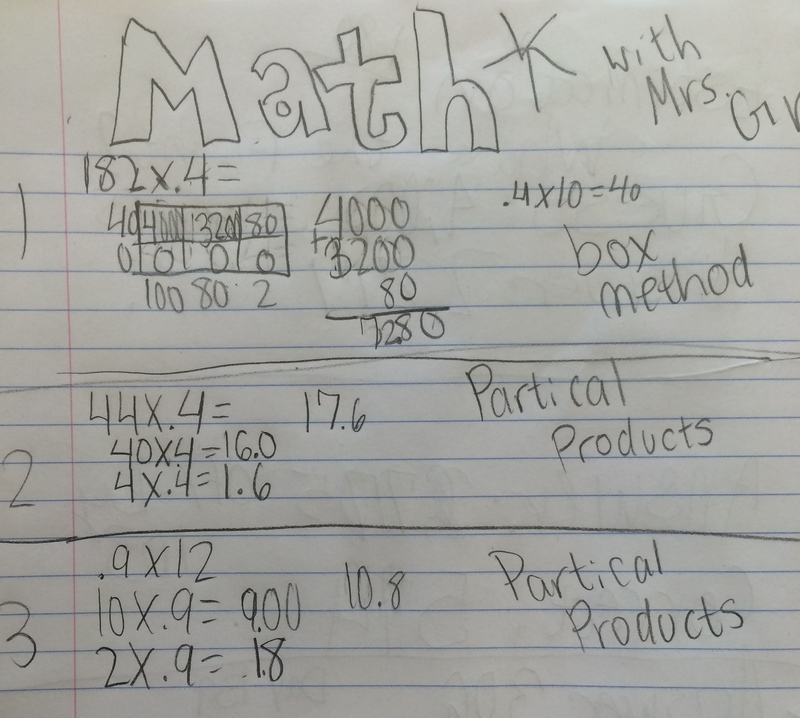 Today, I was lucky enough to be asked to teach a third grade math class because the teacher was going to be out. Since I have never taught the Arranging Chairs activity in third grade, I was excited when two of the other third grade teachers, Jen and Devon, wanted to plan with me yesterday. 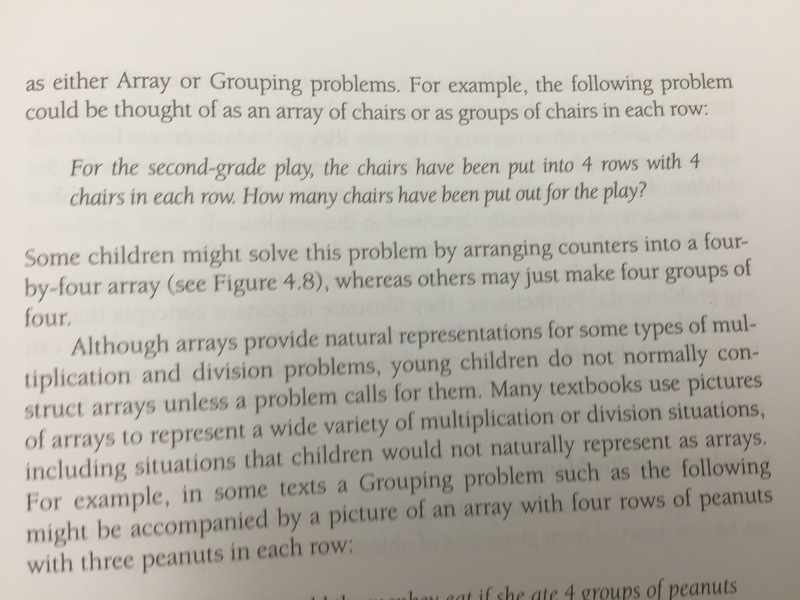 Before meeting I read up in Children’s Mathematics: CGI, Carpenter, Fennema, Franke, Levi, Empson to think more about this idea of equal groups, meets arrays, meets area model builds. Here is one piece I found that connects them in a very nice way. For the most part, students either added rows (so they were seeing the array structure) or looked at the symmetry of the picture. They had so many more strategies they wanted to share, but for times sake, I did a quick turn and talk so they could share their ideas with someone before they left the carpet. Because I heard a student talk about filling in the middle, I asked him to describe to the group what he and his partner talked about. 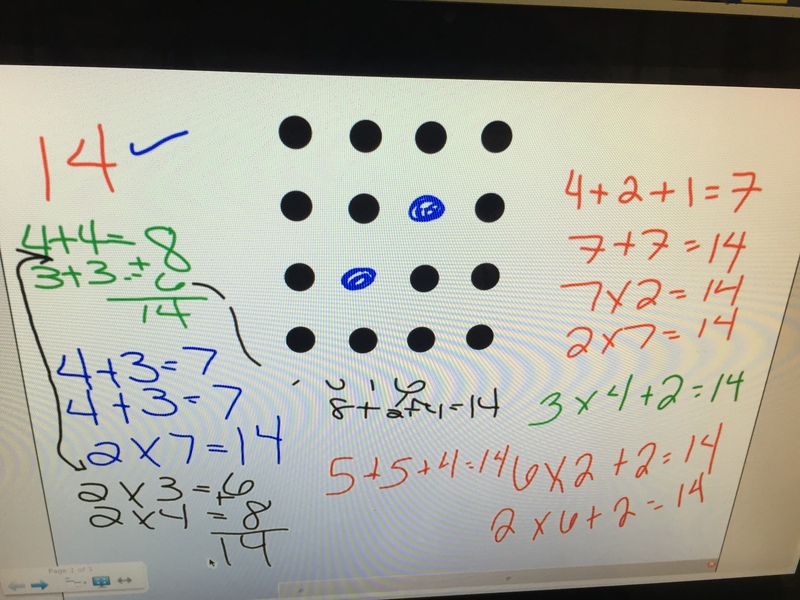 He said, “You could fill in the missing dots and then do 4,8,12,16 minus 2.” I heard the word array thrown around so I asked them to tell what they knew about arrays. A few students built upon one another’s definition ending with something with rows and columns. Next, we introduced the activity on the carpet right after the Number Talk. You have 12 chairs to arrange in straight rows for an audience to watch a class play. You want to arrange the chairs so that there will be the same number in every row with no chairs left over. How many arrangements can you make? They talked to a neighbor and I took one example, a 6×2, and constructed it on the board. 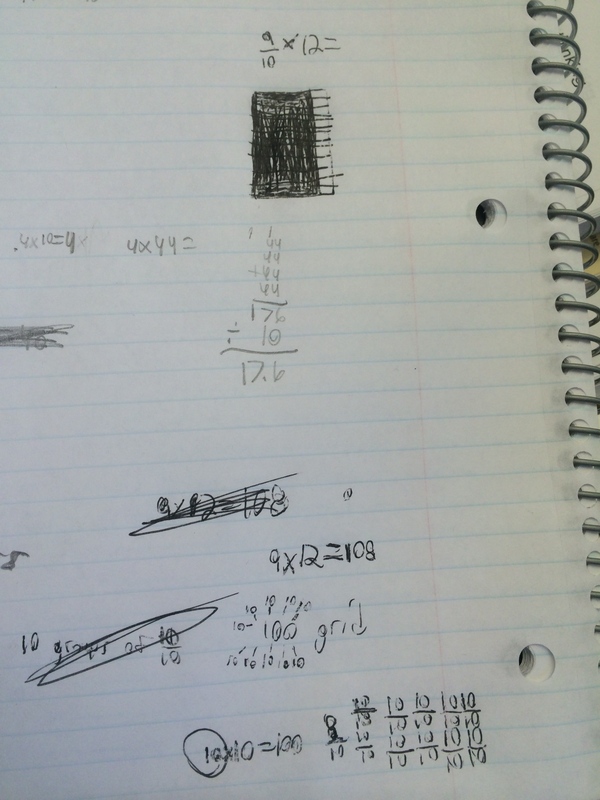 We talked about what that would look like on the grid paper. The grid here felt like a very natural way to move students between arrays as equal groups to rectangular arrays. They went back to their table, with cubes, and worked on making as many arrangements as they could. We shared them as a group. They talked about the commutativity in the rotation of the arrays. We discussed the fact that since we were talking about seating arrangements in this activity, we would consider them two different ways to arrange the seats. This is where I saw the arrays as such a beautiful way of visualizing commutativity in a much different way than they previously had discussed in rearranging number or groups and group sizes. 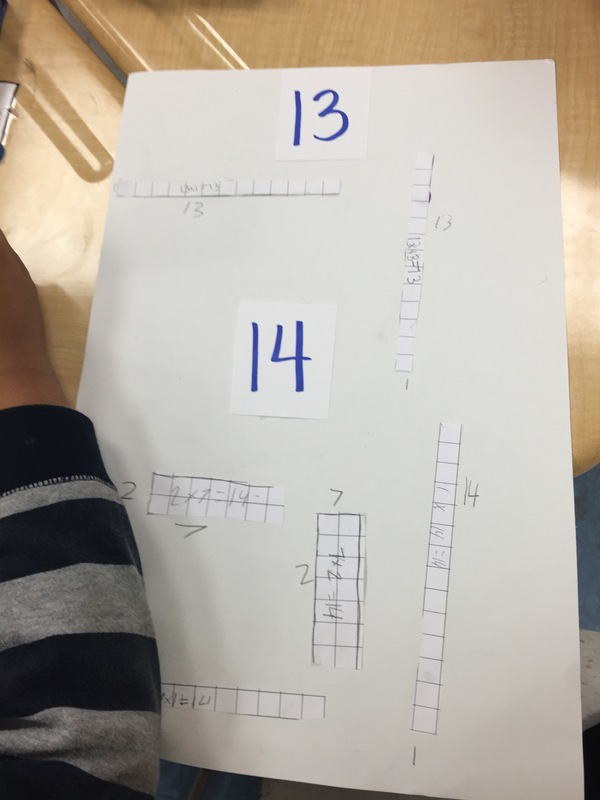 Next, each group was given a number to create as many arrays as they could, cut and paste them on a piece of construction paper. Choosing the numbers for each group was something we spent a lot of time in during our planning. We wanted to be sure that noticings around sets of numbers such as primes, composites, evens, odds, and squares would surface, as well as relationships between different sets of numbers, we tried to be really thoughtful around this. We came up with a first set of numbers and then decided on a second number to give that same group if they finished early. So, this list is first number/second number (although we knew not all would get to the second one). 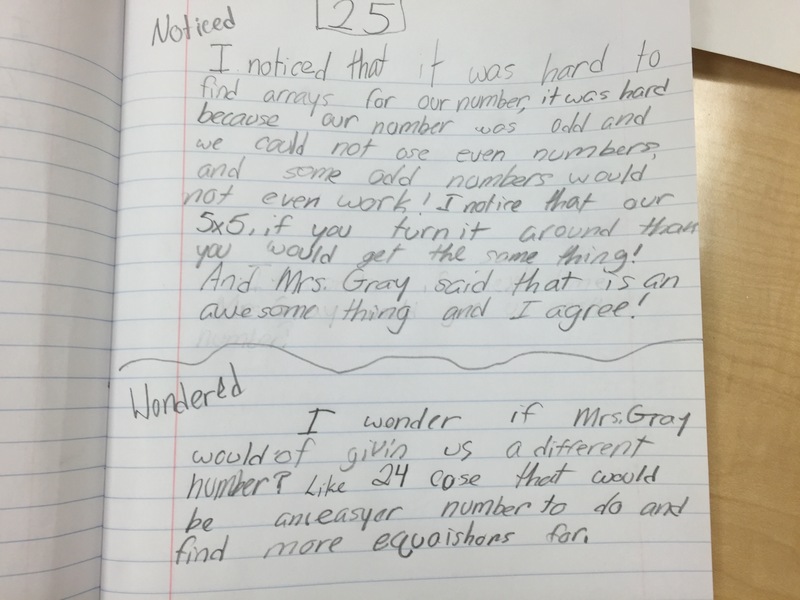 25 / 5 – Odd square number and then relationship to a multiple they did of that number. 15 / 30 – Odd composite and then double a factor. We didn’t think they would finish 30. 13 / 14 – Prime number and then how adding one more chair changes what you can make. There were some beautiful responses that I cannot wait for Andrea (their teacher) to hear on Monday because they were so excited to share! Wonderful comparison of why they feel evens are easier than odds, but also great wonderings about “Is that really all you can do?” with prime numbers and why? 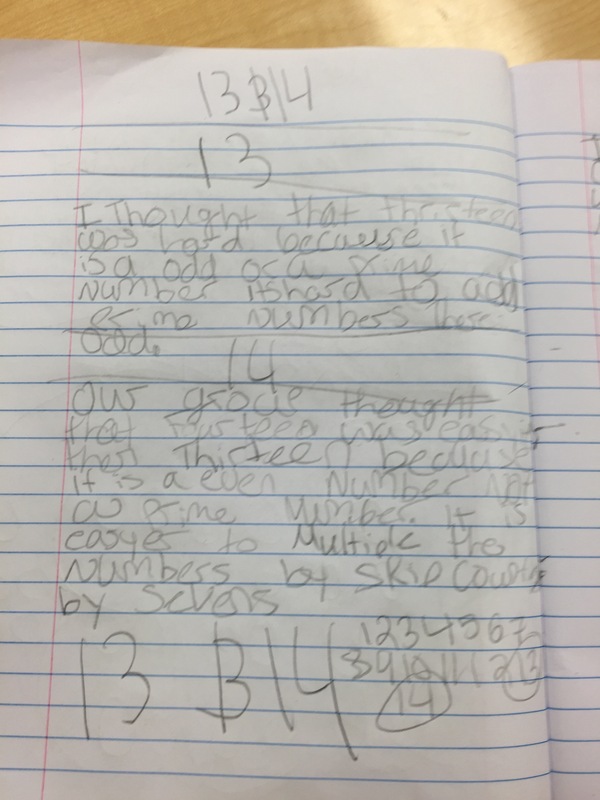 I talked to this student and he was using the 12’s for 24 but had trouble articulating it in his journal. Loved this one wanting a number in the hundreds because it would be more challenging and don’t miss the bottom piece about subtraction! 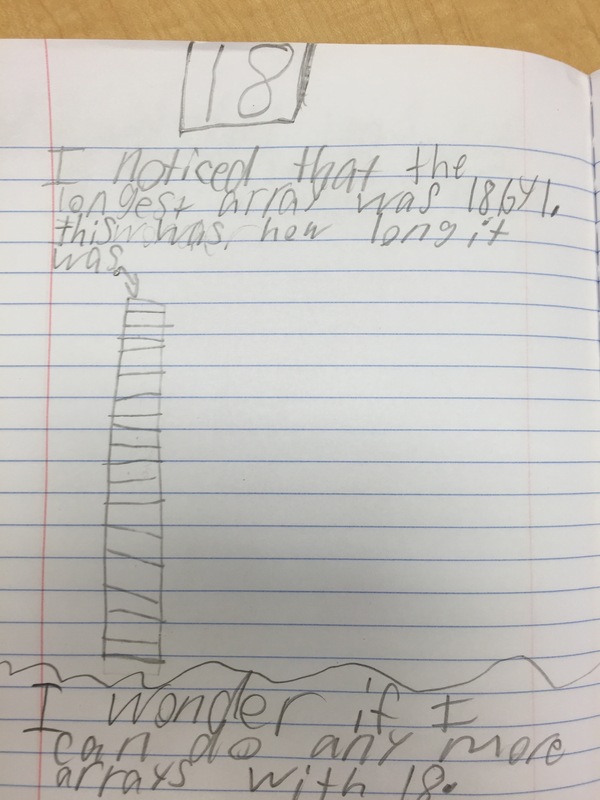 I will leave you with this one that struck me as “We always have more to learn.” I cannot wait to see her working with fractional dimensions in 5th grade! I cannot wait for the gallery walk and noticings and wonderings from the entire group of numbers. 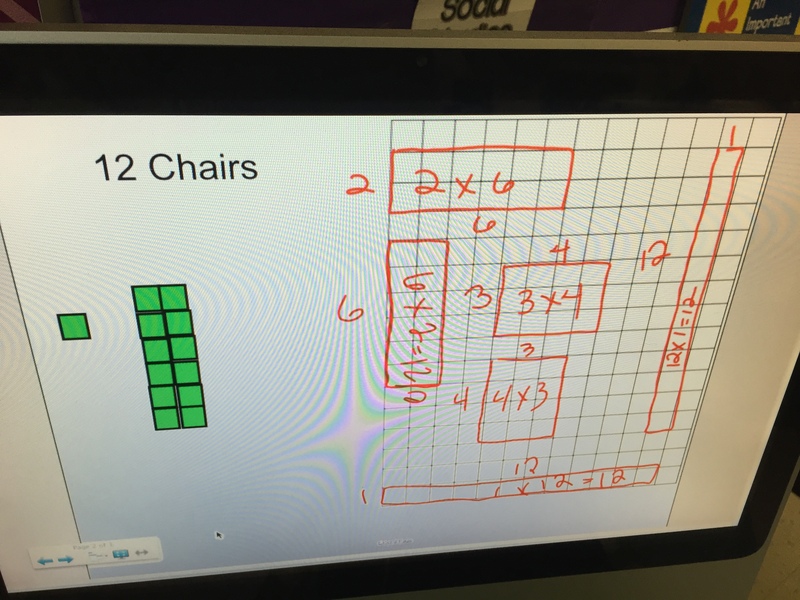 I am also really excited to see this work move into rectangular arrays and seeing students’ strategies around multiplication evolve and how they take this work and form relationships between multiplication and division. Great day in 3rd grade and I have to say, I think Jen, Devon and I planned really well for this one! 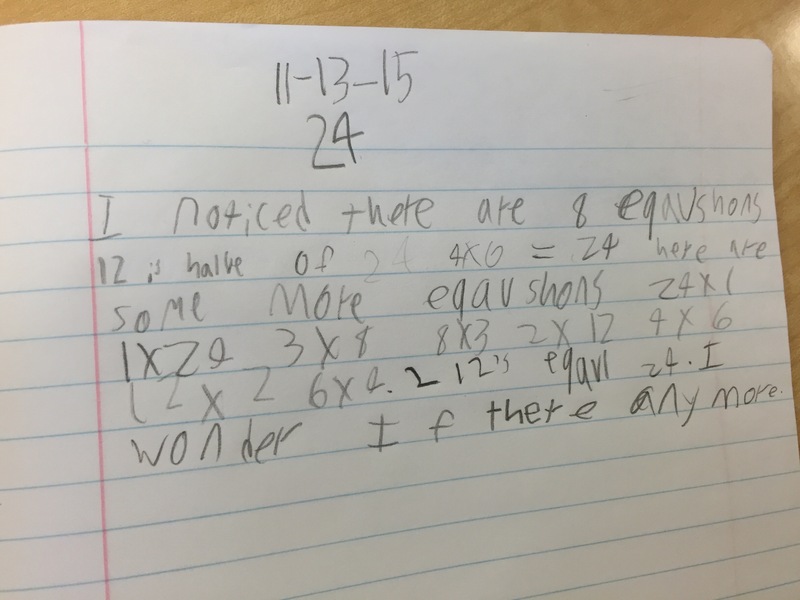 This entry was posted in 3rd Grade, Multiplication and tagged 3rd Grade, Multiplication on November 13, 2015 by mathmindsblog. This week I had the chance to work with a third grade teacher, Andrea! 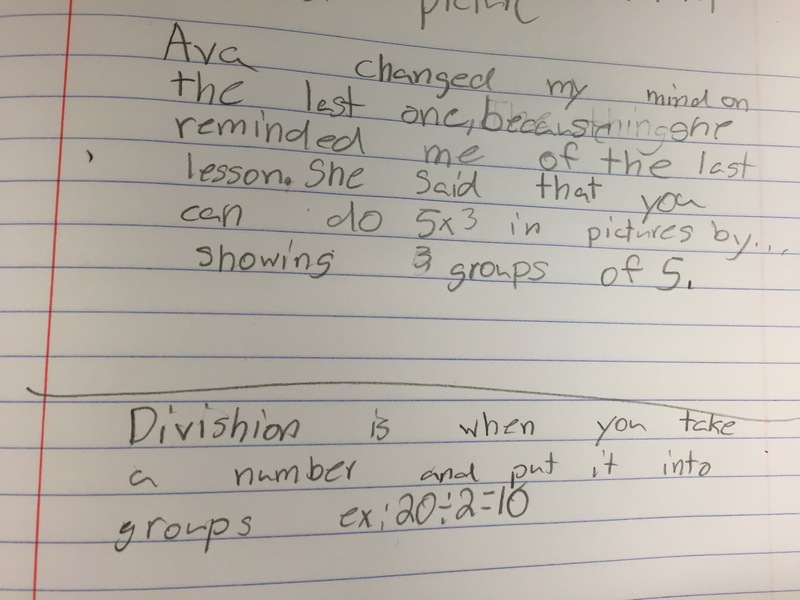 Her class is just about to begin their unit on multiplication and division so she wanted to do Talking Points to see what they knew, and were thinking about, in relation to these operations. 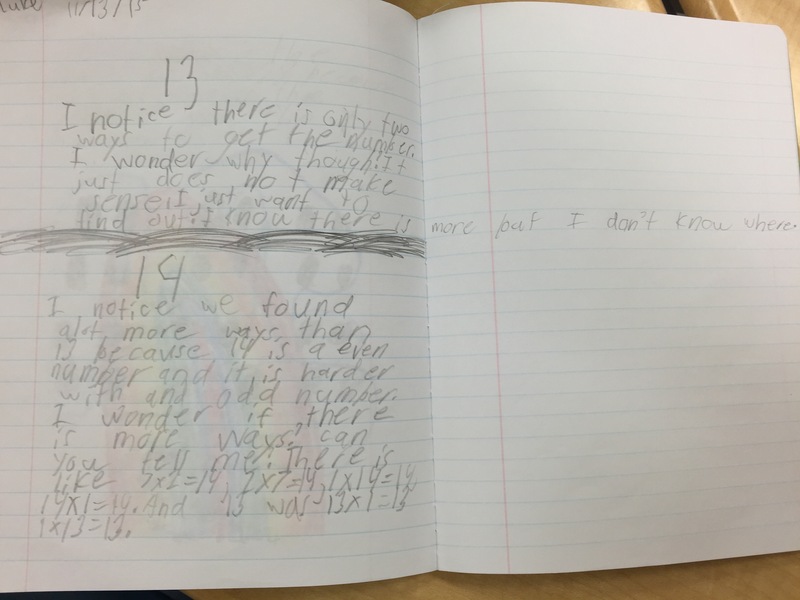 During our planning we discussed the ways in which this Investigations unit engages students in these ideas, misconceptions students typically have, bounced around ideas, and played with the wording of the points. Being my first talking points activity with third graders, I was so excited to see how students engaged in the activity. 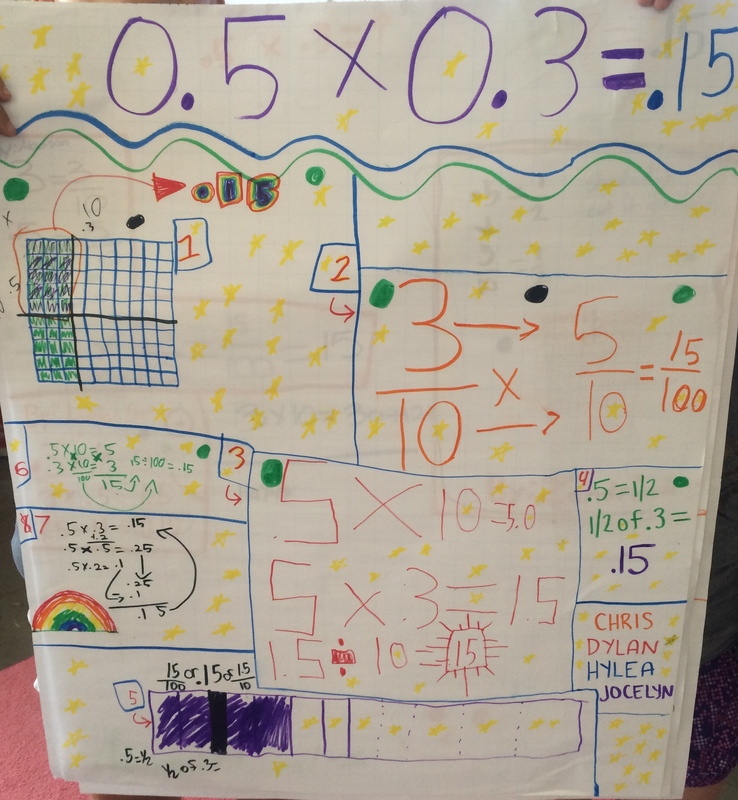 I have found that even during Number Talks, the younger students are very eager to share their own ideas, but listening to others is difficult. 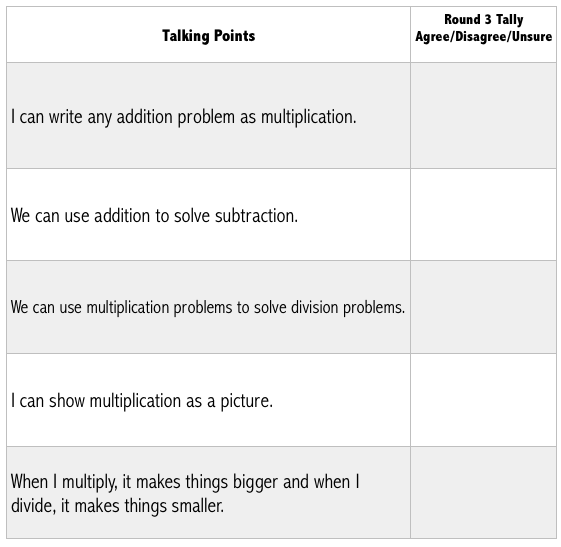 In looking for how students “saw” multiplication and thought about operation relationships, we designed these Talking Points..
Andrea introduced the activity and we did the first talking point as a practice round in which we stopped the groups after each of the rounds to point out the important aspects. We pointed out things like,”I liked how Bobby was unsure and explained why,” and “I liked how everyone was listening to Becky when she was talking,” and “I thought it was great proof when Lily drew something really quick to support her thoughts.” Then we let them go and walked around to listen as well! 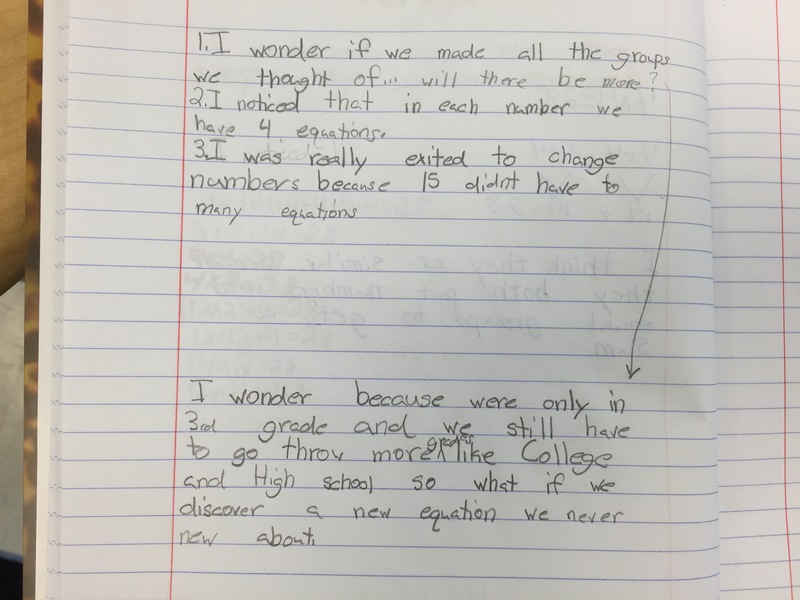 How much students struggled to say why they were unsure. Sometimes it was not knowing what the word division meant, yet they struggled to articulate what it was within that talking point that was confusing them. What a great thing for them to be able to think about!? 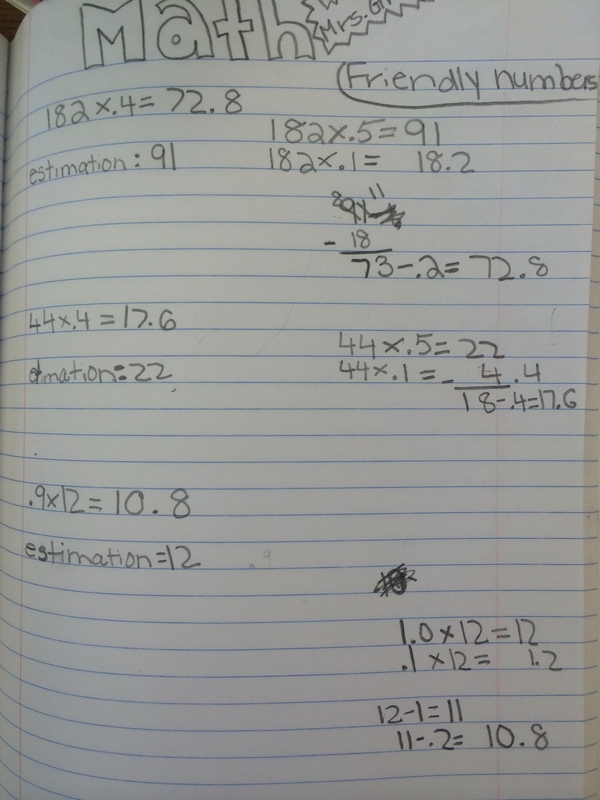 How they related the dot images they had been doing in class to multiplication and division. 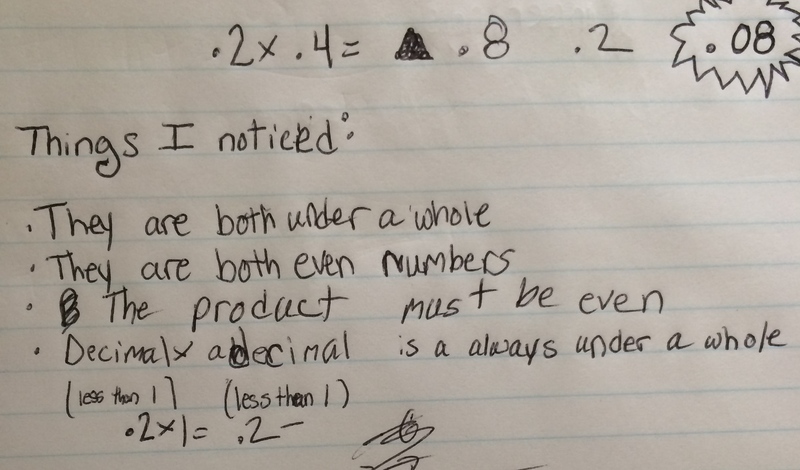 How they thought about inverse operations. They said things like, “I don’t know what division is but if I can use subtraction with addition, I probably can use division with multiplication. 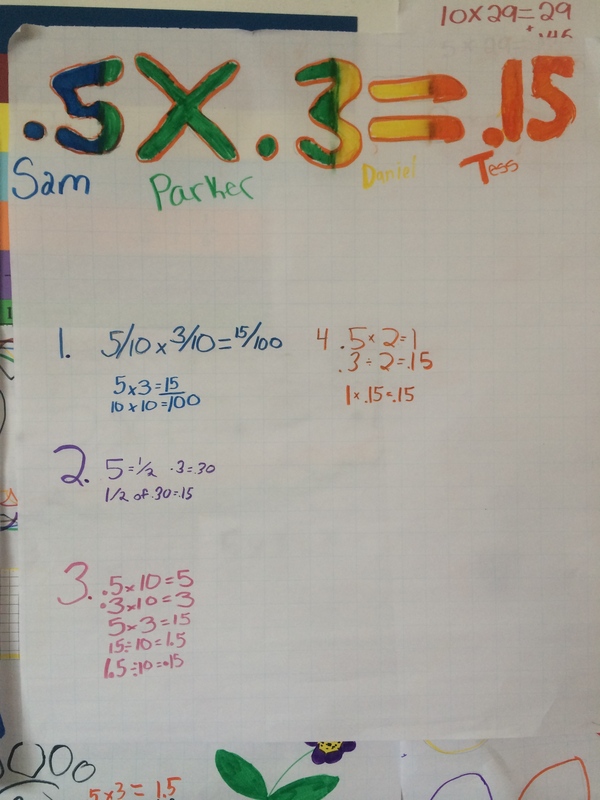 We had pulled two of the points that we wanted to discuss, whole group, afterwards, “I can show multiplication as a picture.” and “We can use multiplication problems to solve division problems.” We put them up and just asked them what their table had talking about. The conversation was amazing. 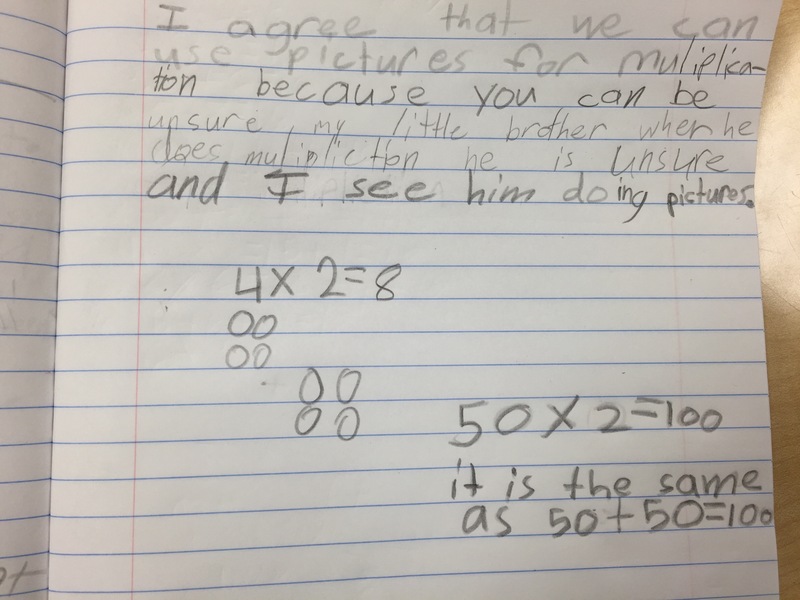 Hearing how they thought about multiplication as groups of but 50 x 2 means “fifty two times” while 2 x 50 means “2 fifty times.” We also heard how someone at their table had changed the way they thought about something. And the division conversation was so great and for the students who were unsure because they did not know what division meant, it felt really organic to come out that way… from them, not us. 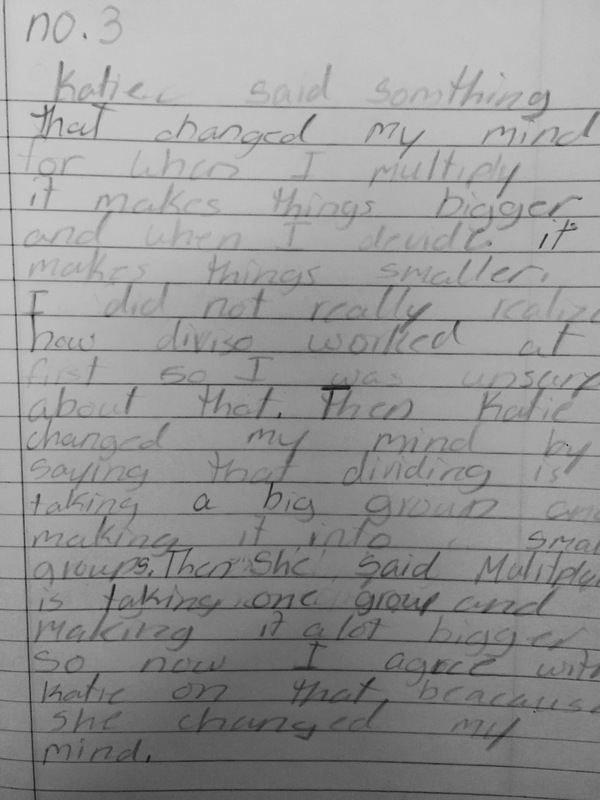 I was so impressed by the way they wrote about their thinking, by 5th grade, they will be amazing!! 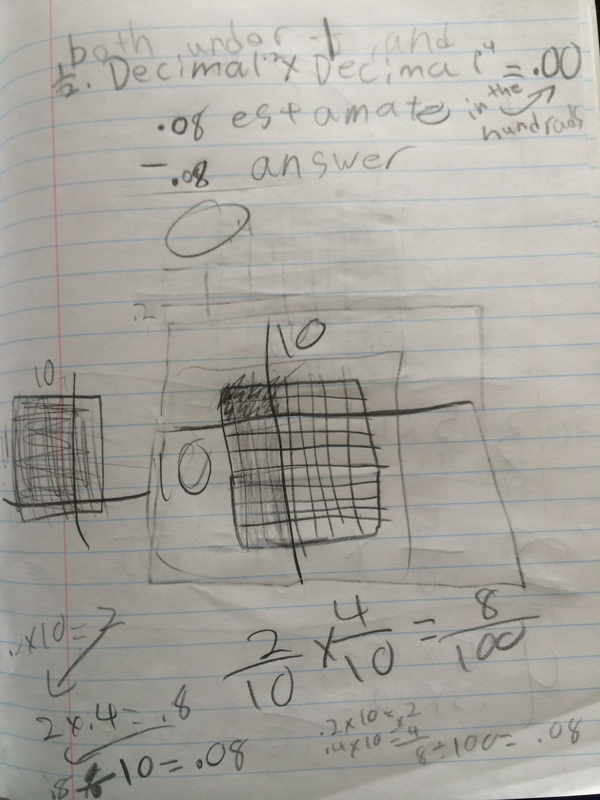 The student above, during the Talking Points, said that he could show multiplication as a picture because “an equation IS a picture.” It was lovely to see him make the connection to a visual for an equation in his journal. I wish the quality of this picture was so much better but her pencil was so light it was hard to see! 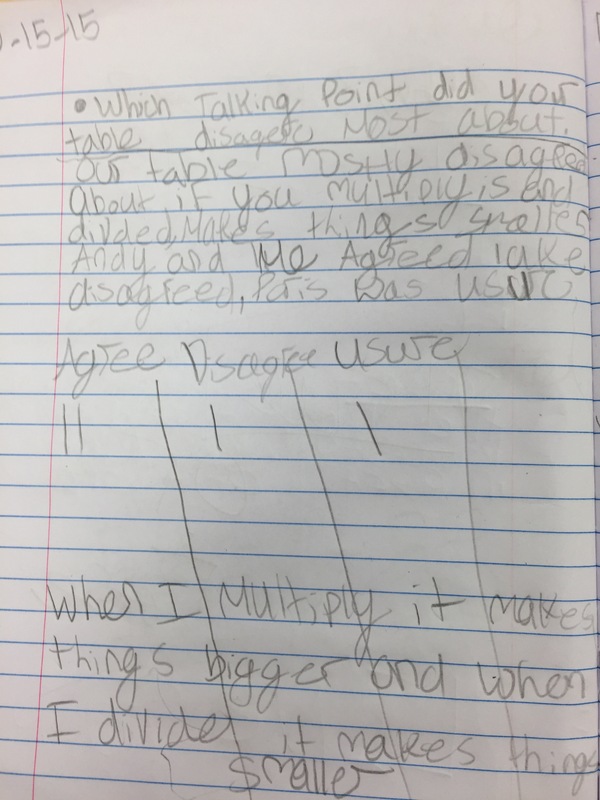 She does a beautiful writing about how exactly someone at her table changed her mind with such an articulate way of talking about multiplication and division! 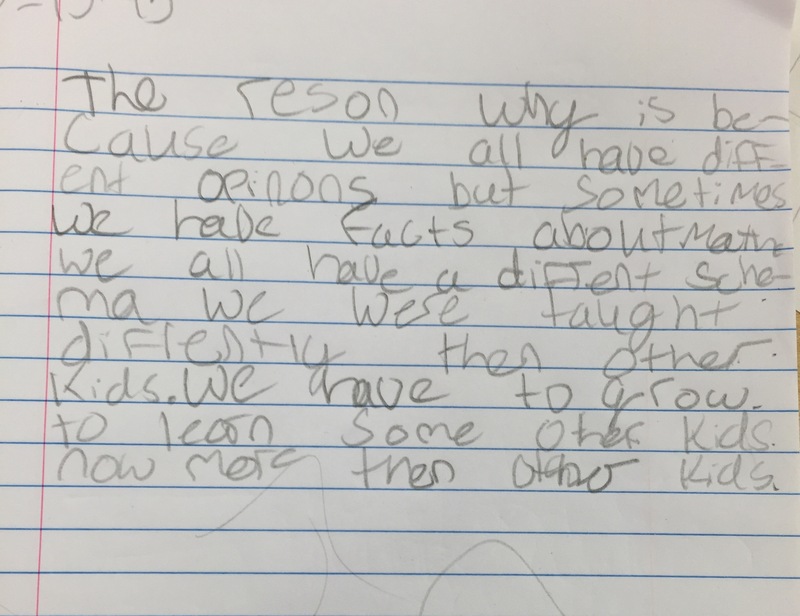 This student above explains perfectly why teaching is so difficult…”…sometimes we have facts about math, we all have a different schema. We were taught differently than other kids.” I am curious to hear more about her feeling about the end piece, “some kids know more then other kids.” Is that ok with her and she understands we all will get there just at different times? These last two were two different ways in which students reflected on the dot images they have been doing in relation to multiplication! What a great class period! 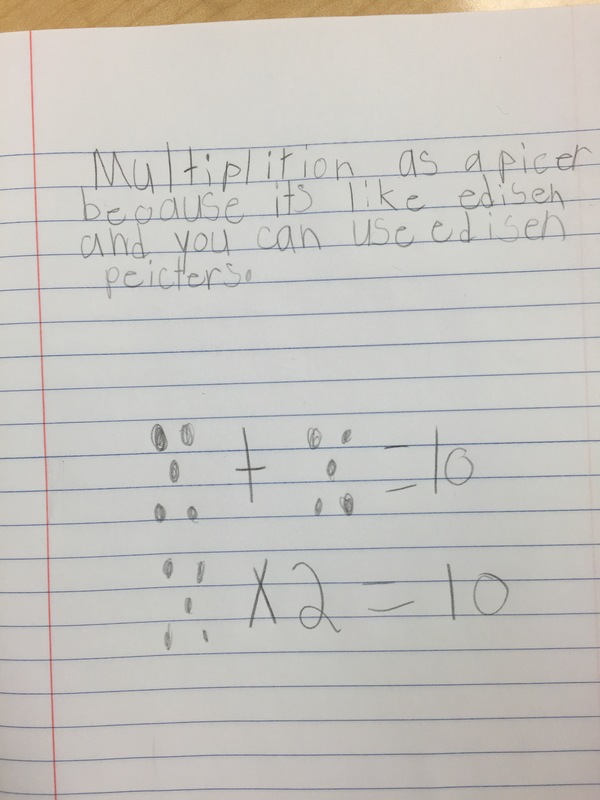 I cannot wait to be back in this class to see how students are working with and talking about multiplication and division! 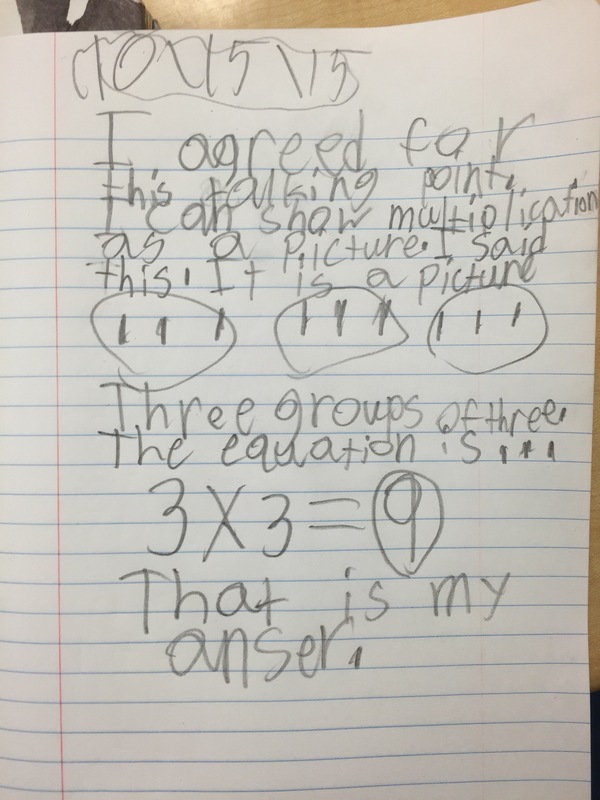 This entry was posted in 3rd Grade, Multiplication, Talking Points and tagged 3rd Grade, Multiplication, Talking Points on October 17, 2015 by mathmindsblog. Flexibility, Efficiency or Starting From Scratch? I ask myself this question numerous times during the course of school week. 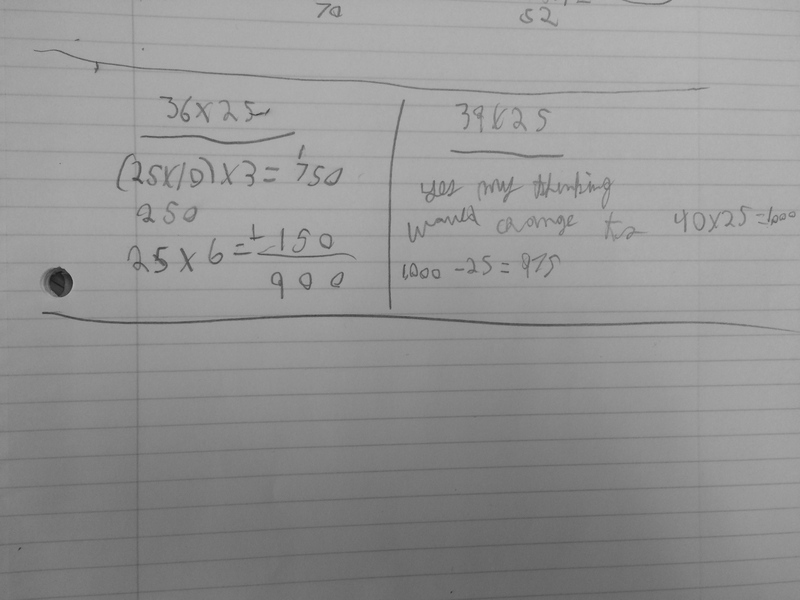 During number talks and in class conversations, the students show such amazing thinking and strategies in solving various computation problems. But, just when I think they are constantly thinking about the numbers, their values and sense-making, they seem to start a new problem from scratch without connecting to any of their prior reasonings. Is it flexibility in their thinking, efficiency or seeing each problem as a new one? 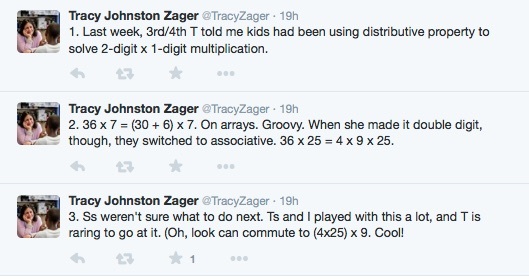 I was SO glad to see I am not alone when I read Tracy’s tweets yesterday…. 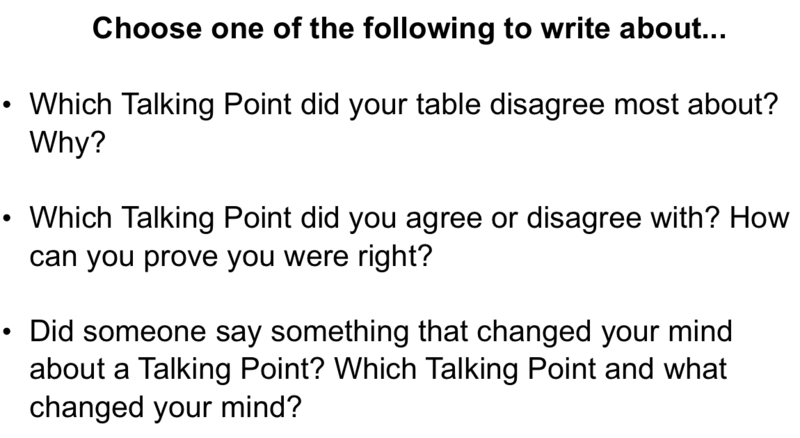 The conversation was an interesting one that then seemed to moved into number choice and thinking about what the students were thinking and what we do as teachers from here. We all definitely had a lot more questions than answers, which is always fun to explore! So, of course I had to test out some of our questions into my number talk today. 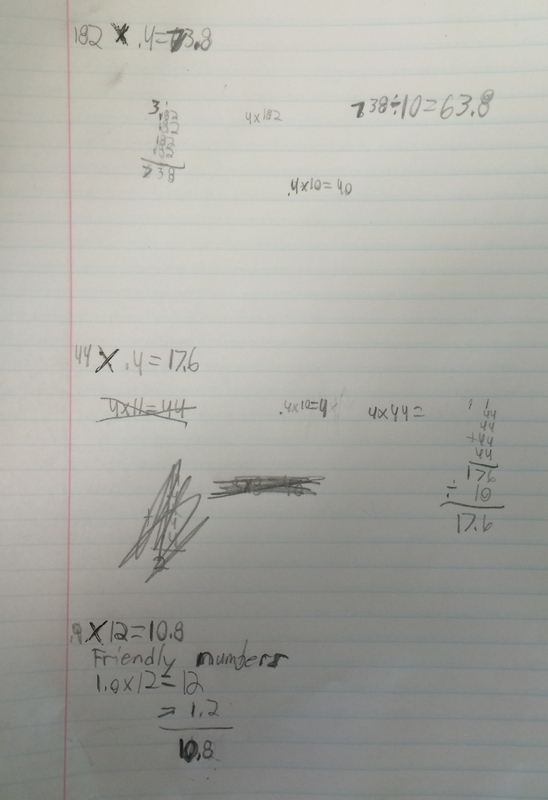 I had the students do the number talk from their seats so they had their journals readily available. 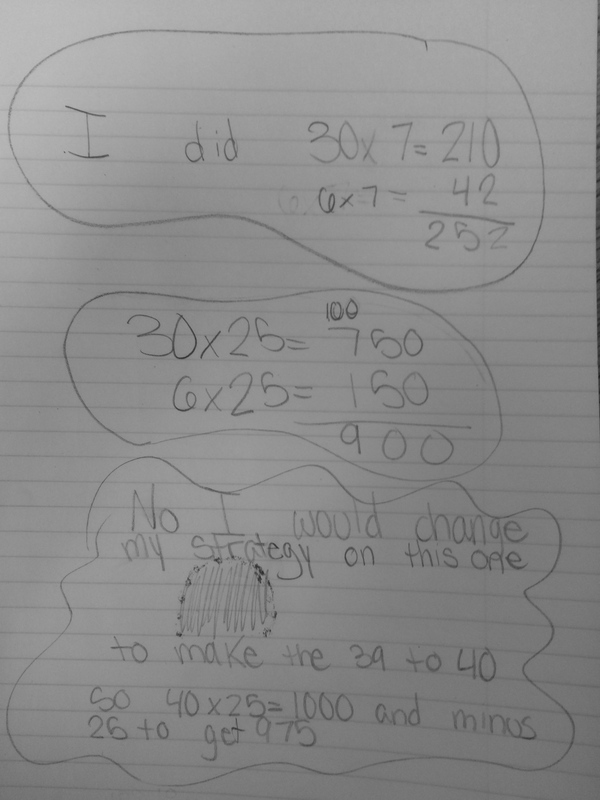 I gave them 36 x 7, asked them to solve mentally and really think about the strategy they were using. 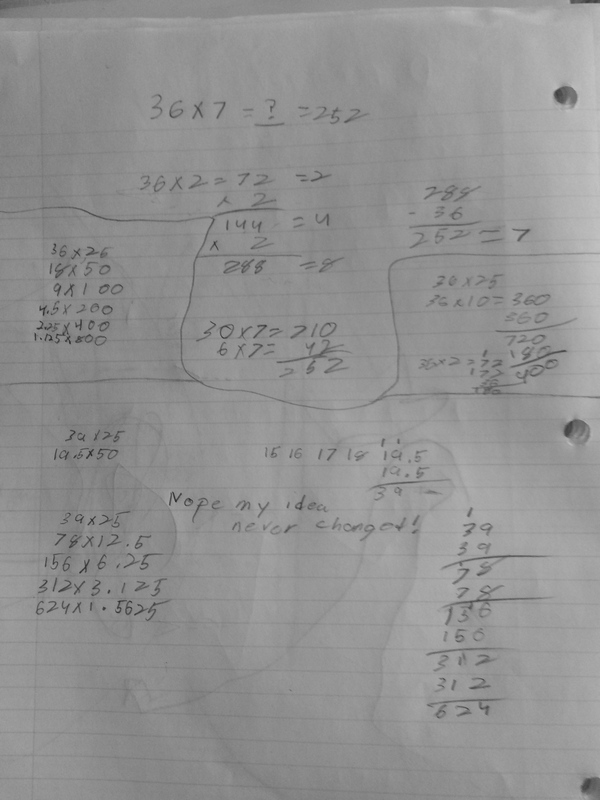 I took answers, they all got 252, and I asked them to jot down how they solved it. 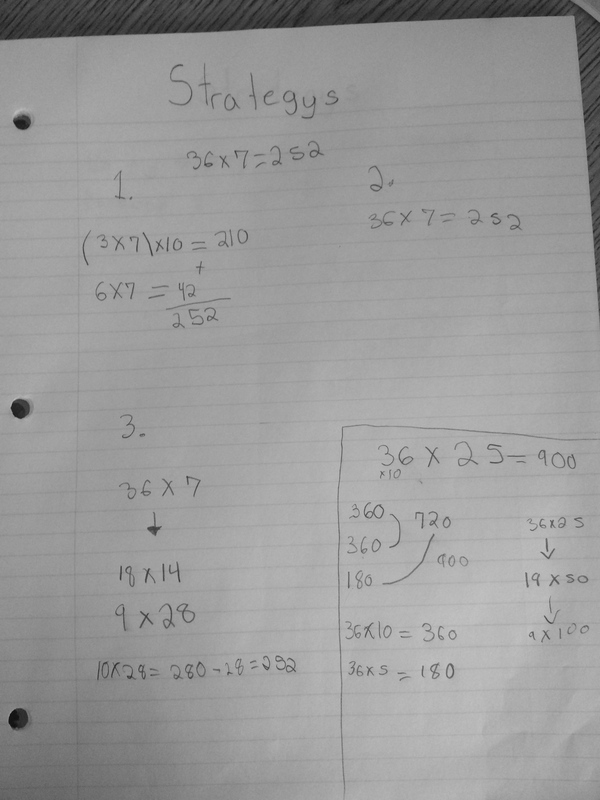 We shared out and the majority had solved it just as Tracy had mentioned in her tweet, (30×7) + (6 x 7). 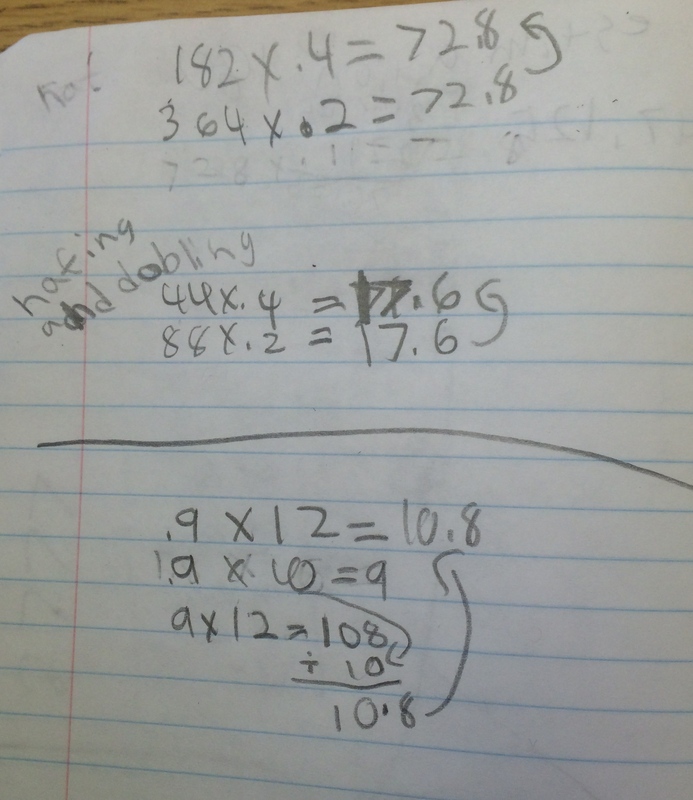 Then I gave them 36 x 25 to see if, when given a 2-digt x 2-digit, they changed their thinking. 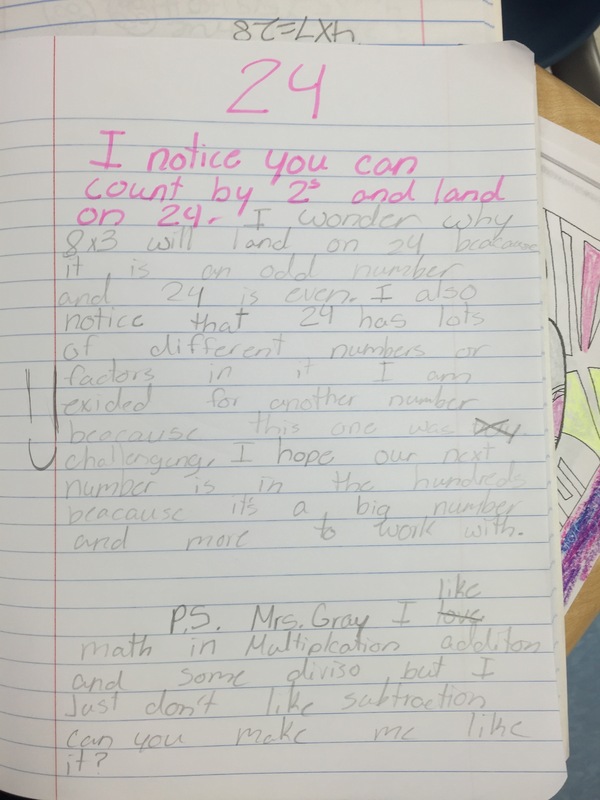 I was also interested in the influence of the number choice of 25. I don’t think it was the two-digit times 2-digit number that changed their approaches, but more so the influence of the 25. 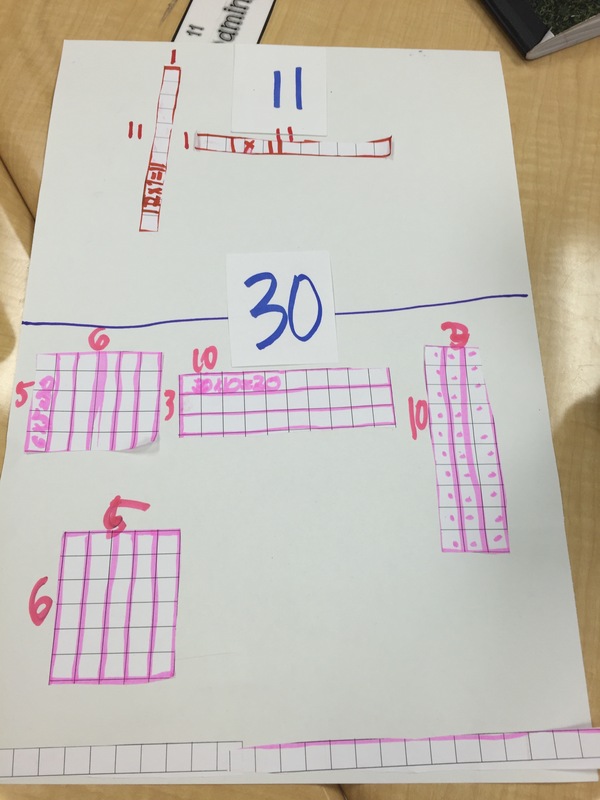 A lot went to double/halving because they could get to 50 and 100 and others used the 100 made of four 25s. 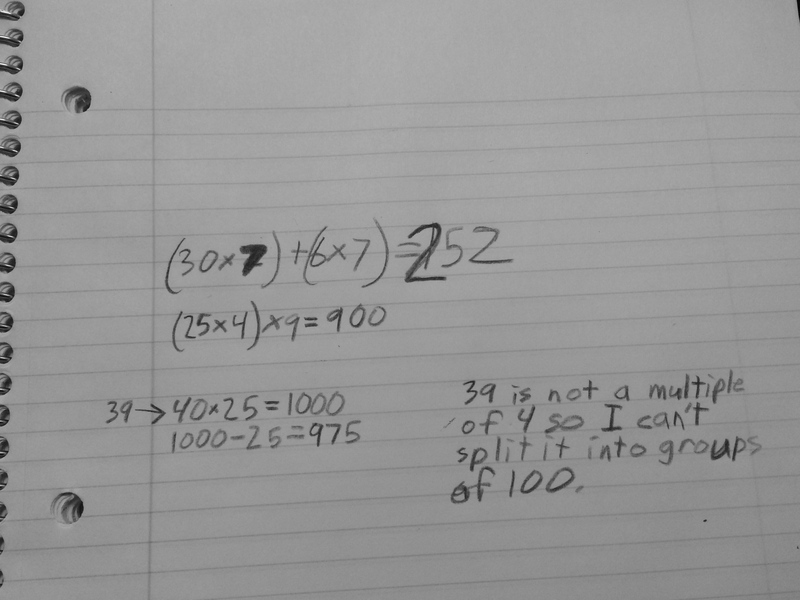 One student multiplied 40x 25 and subtracted 100 while a few others used the associative property that Tracy had mentioned (4×25) x 9. My conclusion is: the more students talk about their strategies, reasonings, and choices, the more they think about the numbers and what “makes sense” in the solution pathway. 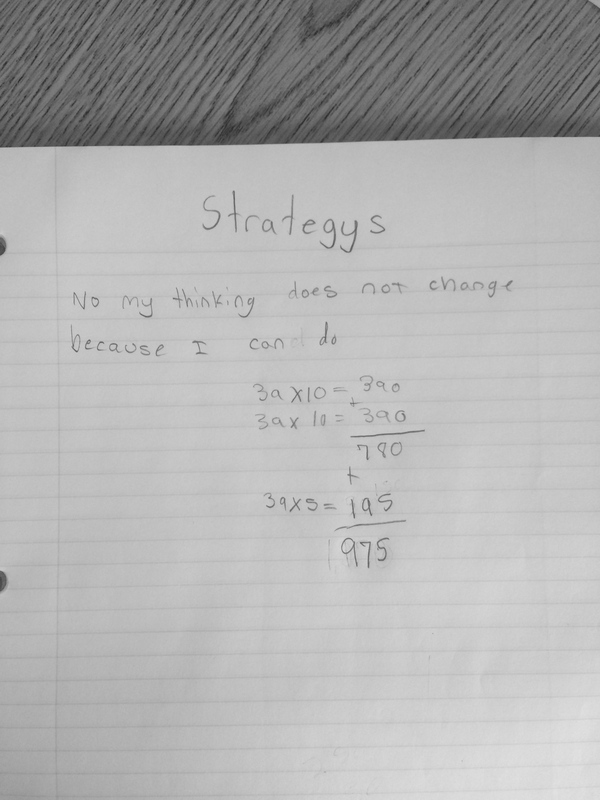 I think some students definitely get into a comfort zone with a strategy that works for them, and that is ok with me, but I definitely want to expose them to other ideas and things to think about. 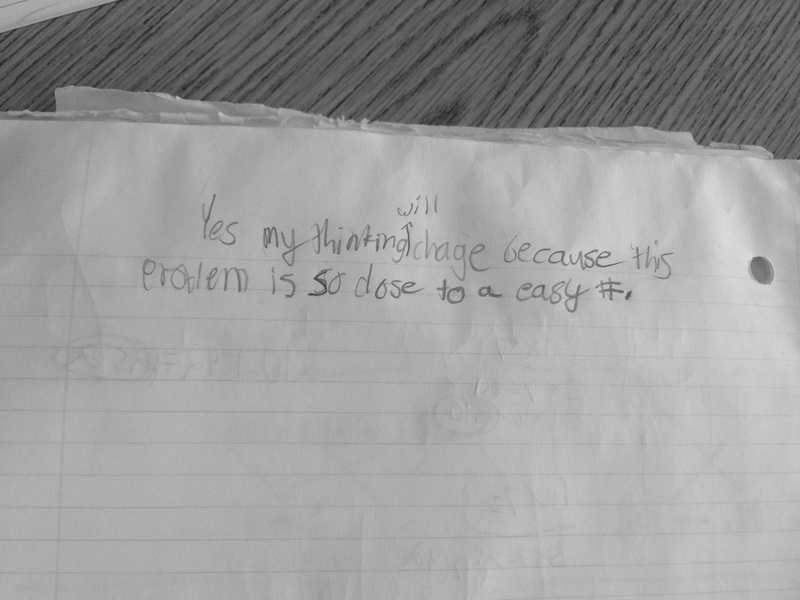 I loved that 25 and 39 influenced their thinking about the way to approach the problems. Hope this gives you something to think about Tracy, Christopher, Sadie, Simon and Kassia! 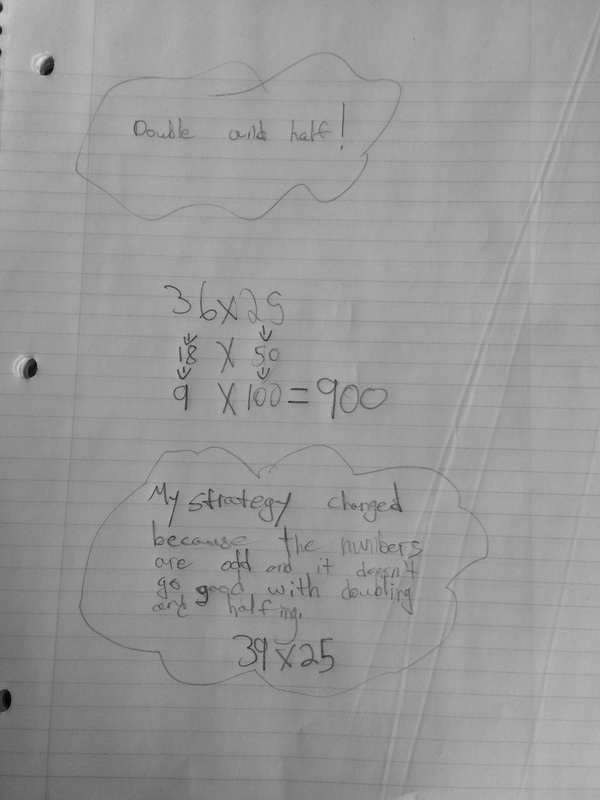 This entry was posted in 5th Grade, Number Talks and tagged 5th Grade, Multiplication, Number Talks on March 19, 2015 by mathmindsblog. 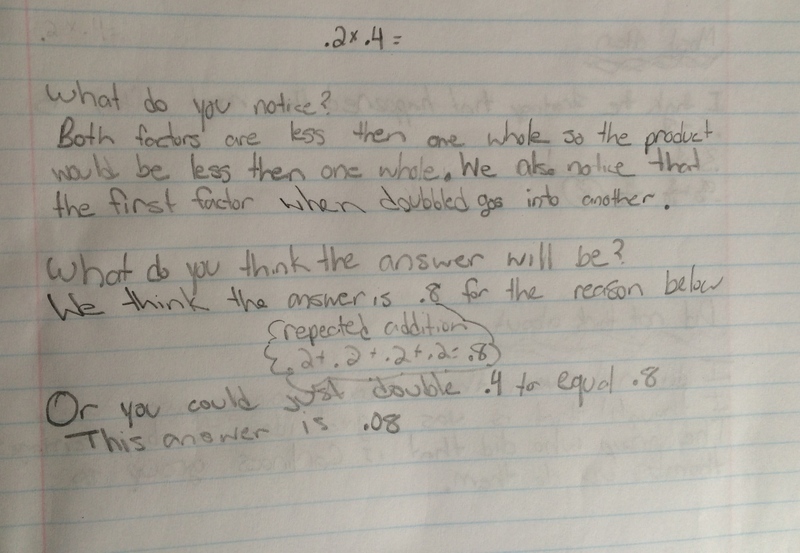 Unanticipated Student Work…Always a Fun Reflection! 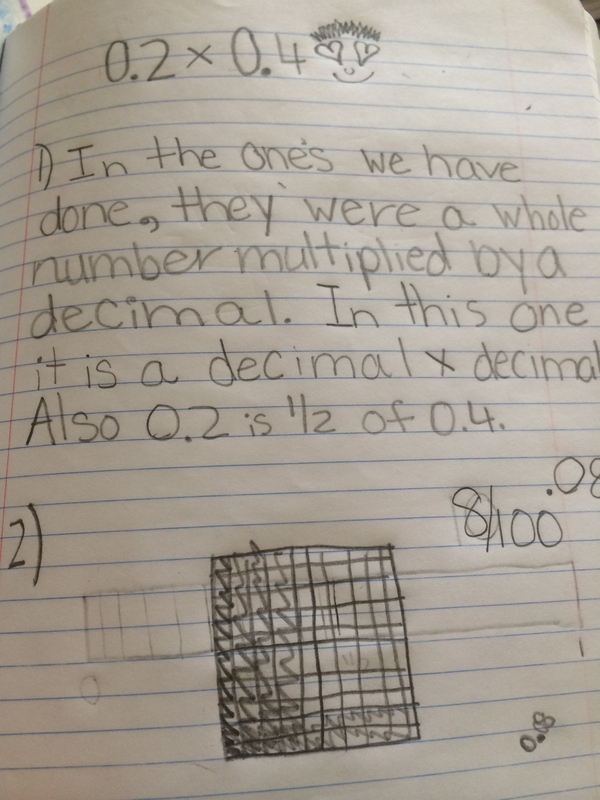 As I was planning for a summer PD, “Decimal Fluency Built on Conceptual Understanding”, I was going through pictures of my students’ work. 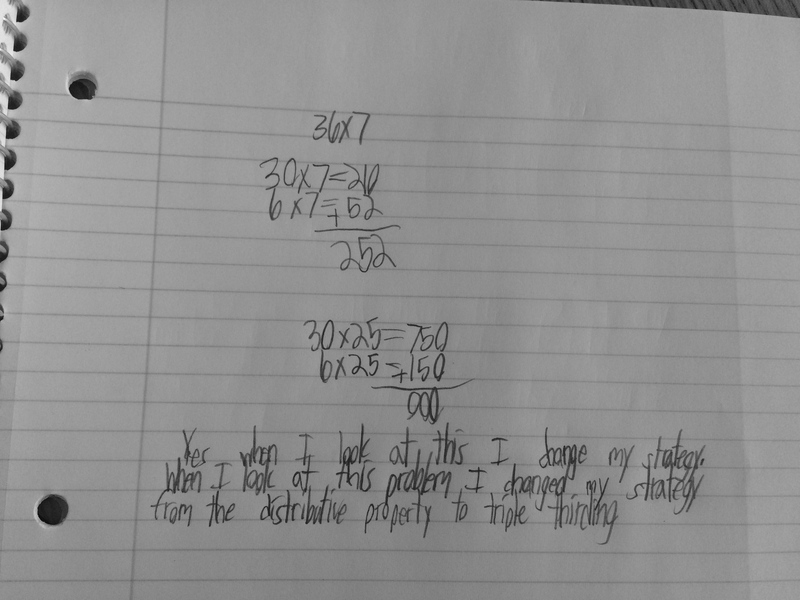 I focused on the very first multiplication problem I had presented to them in which both numbers were less than a whole. 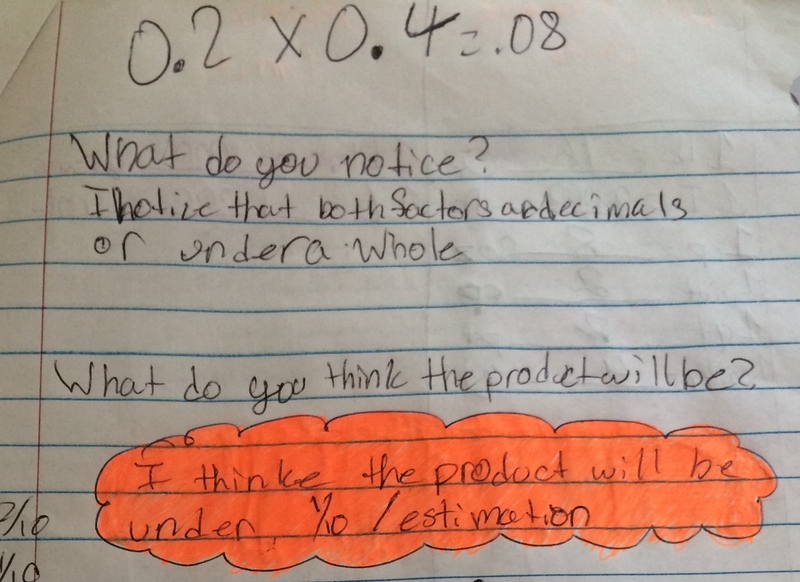 I presented them with 0.2 x 0.4 and asked them to do a “Notice/Wonder” and think about the product. I had anticipated some may reason using fraction equivalents, some may know that .4 is close to half and take half of .2, and some may try fraction bars or arrays to solve. Here are samples of their initial work…. During the share out, this is the one response I did not anticipate at all and now, going back, I wish I had spent more time with…grrr….darn hindsight! For all of the nerdy math peeps, like me, who like to “figure things out” I am going to leave out her explanation here! I will gladly recap it for anyone who would like to hear it in the comments or via twitter! 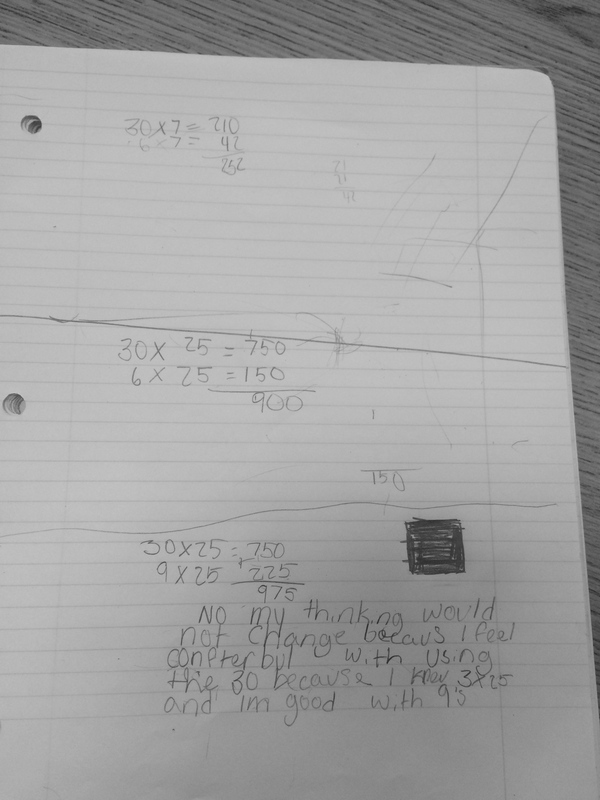 Needless to say it left many students a little baffled, and we did revisit it the next day for her to re-explain her reasoning. 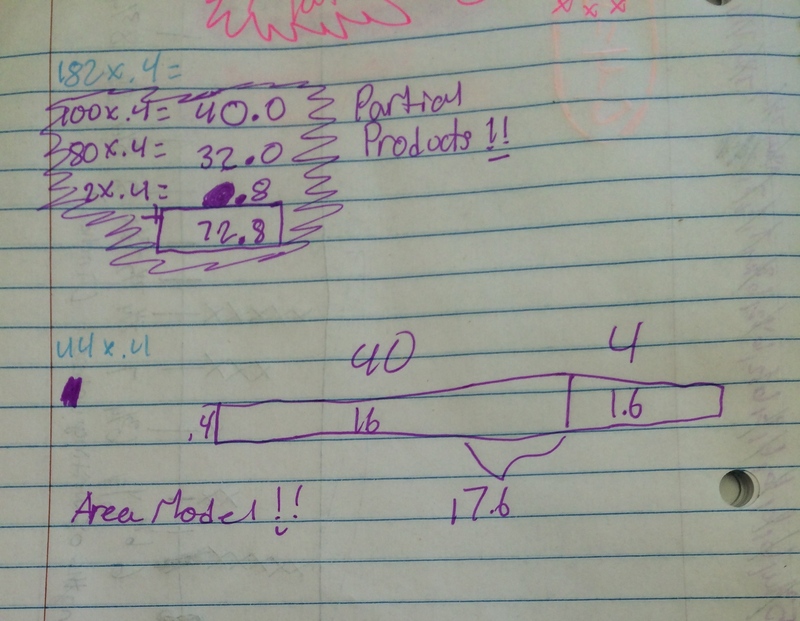 I just wish I had extended this by asking students if this model would work for any two decimals less than one whole? Why does it work with .2 of .4? I highly recommend snapping pictures of your students’ work all year long because reflecting back on this work over the summer has taught me a lot about anticipating student responses and how to handle those responses you just don’t expect! 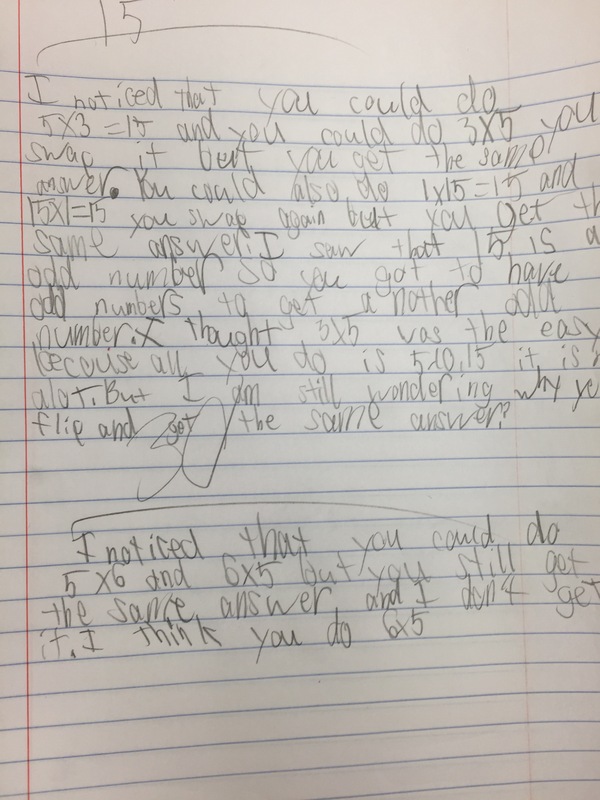 It also just makes me smile at the way my students reasoned about the math we were doing! 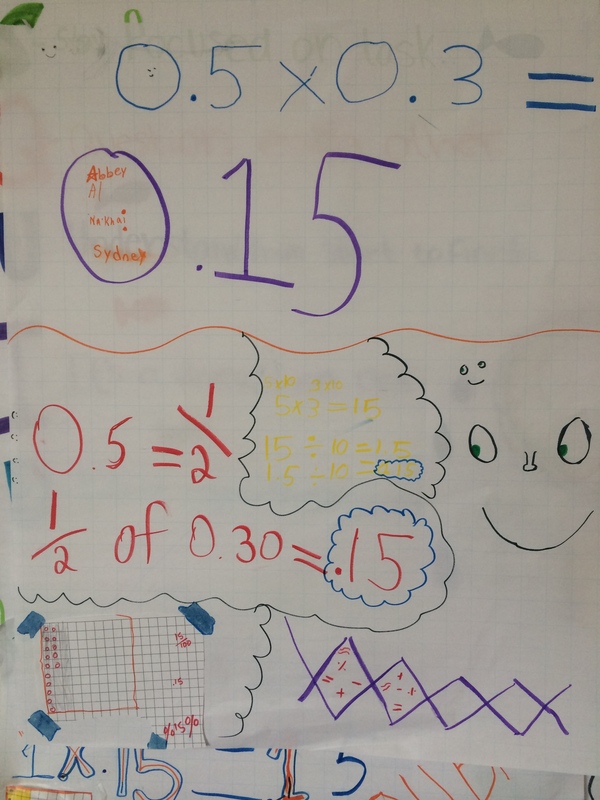 Here are a few pictures of the follow up group work and Gallery Walk they did with 0.5 x 0.3…. 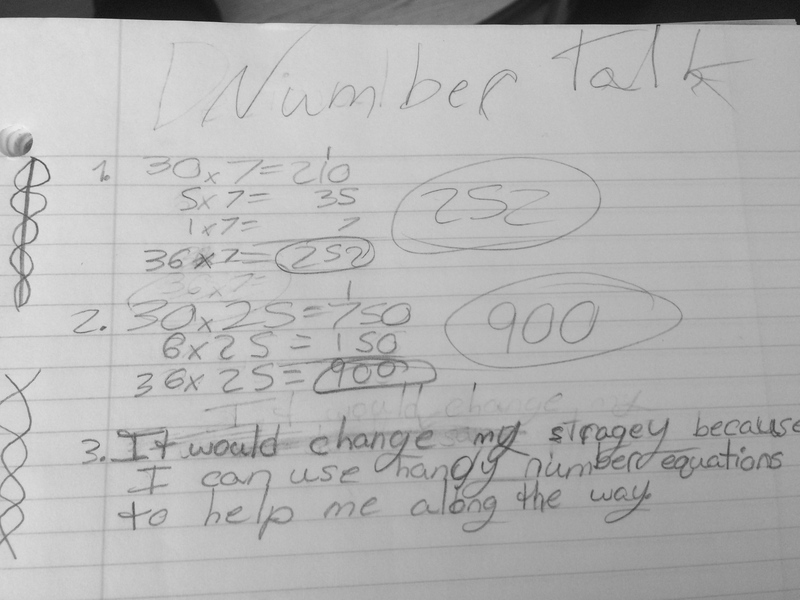 This entry was posted in Decimals, Math, Uncategorized and tagged anticipating student responses, decimals, Multiplication on July 25, 2014 by mathmindsblog. 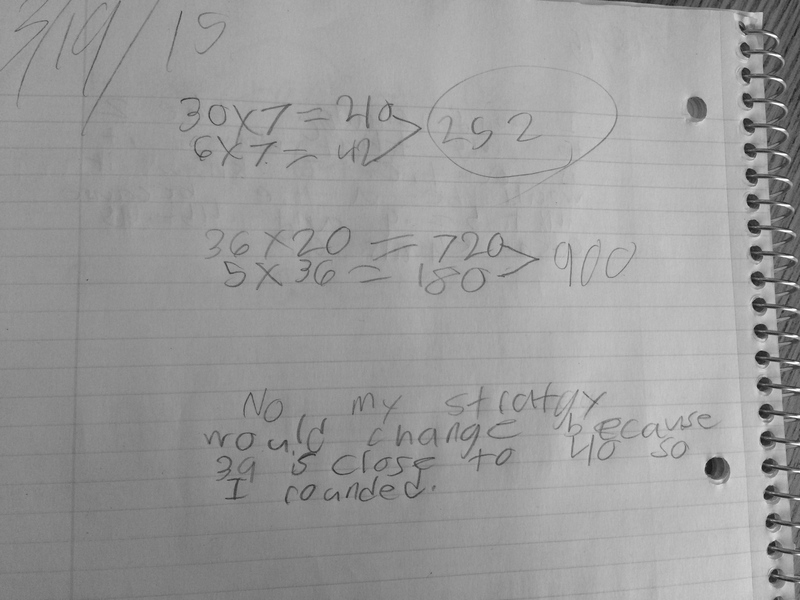 I wanted to assess where they were before we moved into a decimal times decimal work because I think there is a lot of reasoning to do there before we come to a generalization! 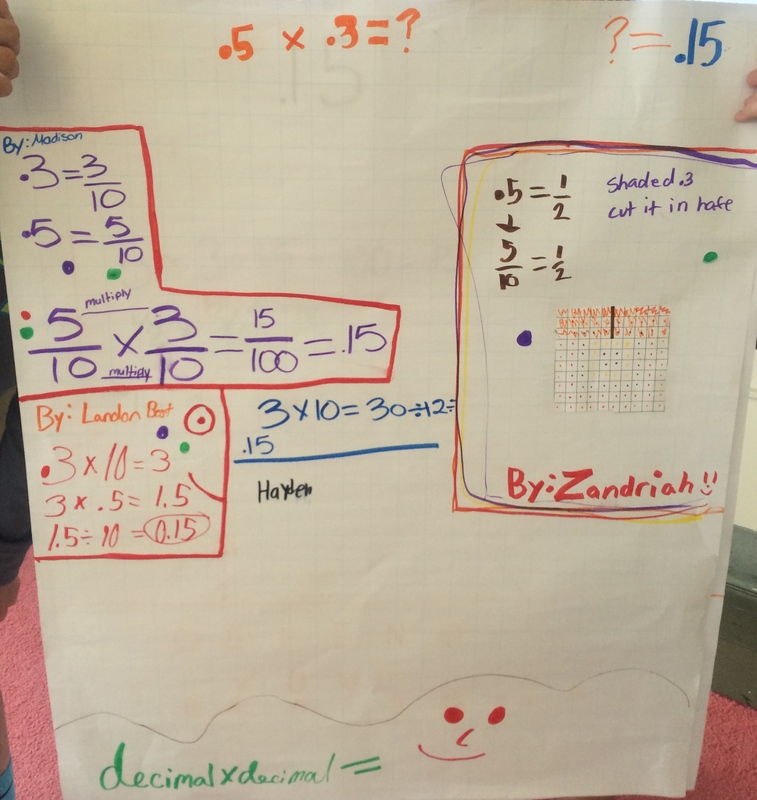 I was really excited to see the use of multiple strategies! I loved this area model because of the size of the .4 side. She was very particular about that! 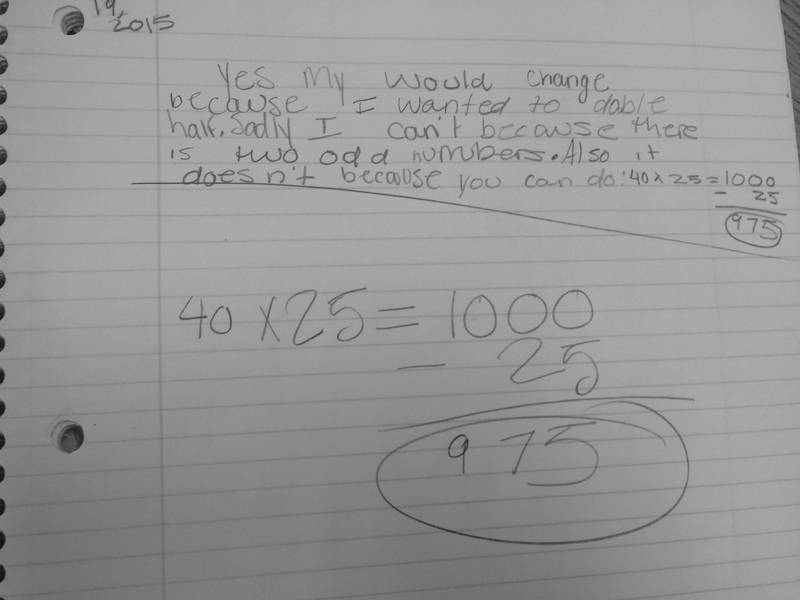 Some friendly number work…I especially loved her estimation first….yeah! 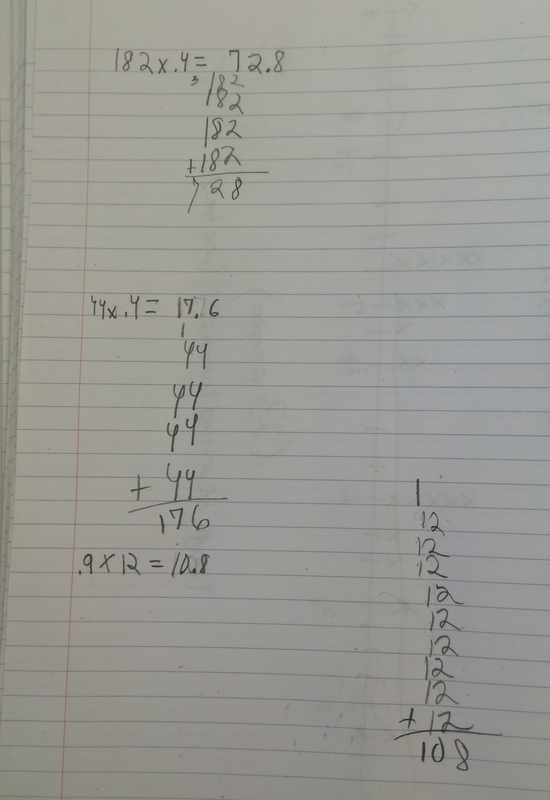 I had a student think about the decimal as a fraction. 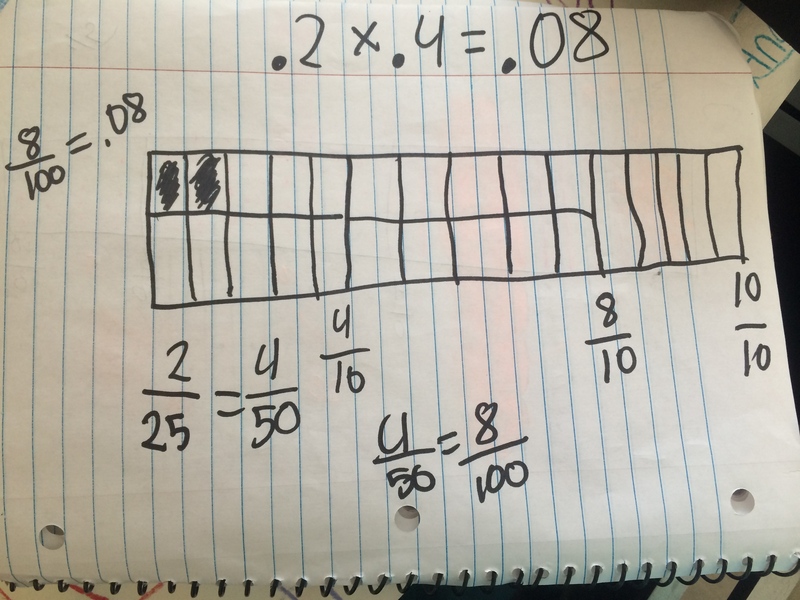 It starts at the top and then he jumps to the bottom of the page.He said he multiplied 9 x 12 to find out how many “rows” he would have, 108. Then he divided it by ten because there were 10 rows in each grid. It was interesting! So tomorrow we start decimal by decimal multiplication…I feel great about our start and I look forward to having them reason about decimals less than a whole times less than a whole. 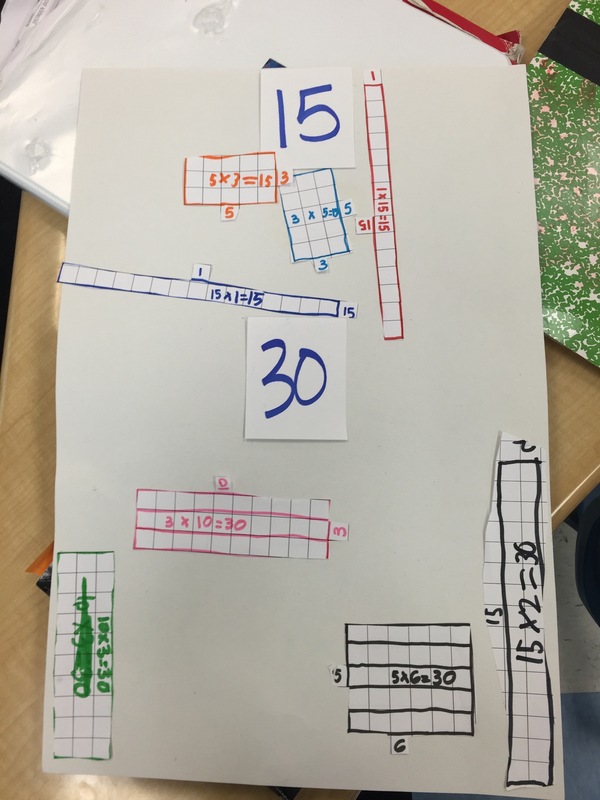 This entry was posted in Decimals, Math, Number Talks, Uncategorized and tagged 5th Grade, decimal, Decimal Multiplication, Multiplication on May 5, 2014 by mathmindsblog.